Feature: Eco-friendly, have large stock, could supply goods in a short period. And It is suitable for both men and women. Many pockets are reasonable enough to accommodate and protect smaller tools or accessories, such as pliers wrench, screwdriver, tire watch, small flashlight, etc. Double side package pockets, reasonable design, can carry mobile phones, small change and other practical items. It is convenient and practical. Multi function toolkit can be used for cleaning, housework, gardening and so on. It can store scissors, seeds, plant labels, ropes, notebooks, cell phones, pens and so on. Material: oxford fabric, therefore very strong and durable - ideal for garden tasks, such as the professional technicians carry tools or plants and other seed (garden bag without tools). 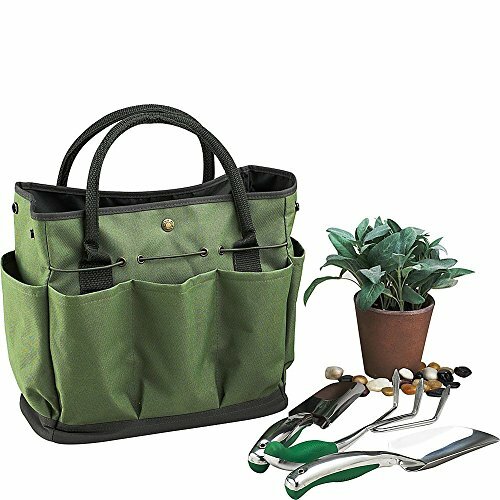 The Army Green Garden Tools Bag is 13.5 x 6.8 x 12 inch in size and offers space for whatever tools and plants. It is Sturdy, light and capacious with an attractive design. Having this handbag can make you seem more capable and efficient in completing your work. Comfortable in your hand, and make your tote bag easy to carry. If you have any questions about this product by KASOS, contact us by completing and submitting the form below. If you are looking for a specif part number, please include it with your message.